The below block of code sets up a loop which contains 3 conditions within. This condition runs only once before the execution of the code block. This condition runs every time after the code has been executed in the for loop. currentValue is a required argument. It represents the value of the current item in an array. index is an optional parameter. It represents the current element in an array. array is an optional parameter. This array represents the current element which belongs to the array object. 3. How to work with jQuery each Loop? jQuery’s each() method is very useful when it comes to loop through each and every item of the targeted jQuery object. 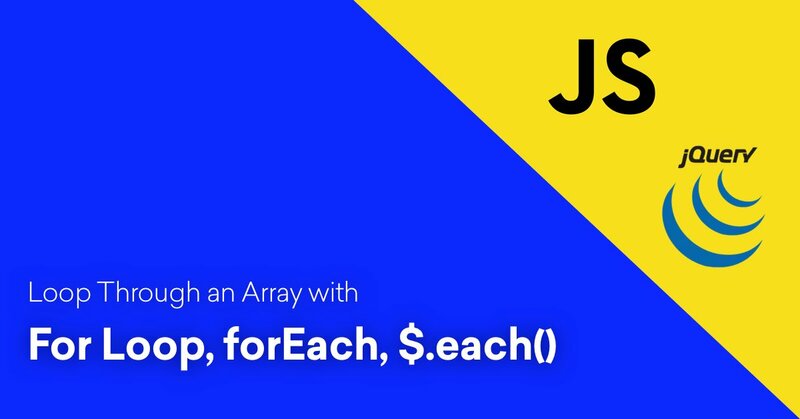 It specifies a method to run for each matched item in an array in jQuery. To make jQuery work on your project, don’t forget to add below jquery CDN URL. jQuery is dependent on external dependencies. A function(index, element) is required value in jQuery’s each loop. It runs for every matched item. The index represents the index position of the selector element. The element represents the current element of the selector. We can also use this method for it. As a programmer, this is your task to recognize which method or technique works best for you.